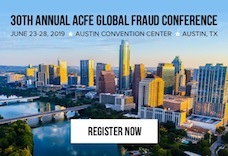 ACFE President James D. Ratley welcomed more than 3,000 attendees to the 28th Annual ACFE Global Fraud Conference in Nashville, Tennessee. In keeping with the theme, Ratley thanked our heroes for their contribution to the anti-fraud profession. "By joining in this global fight, you, too, are a hero."